"It's a great time to be a con man in America." Well, this just got interesting. Hulu has debuted an official trailer for and already released their documentary Fyre Fraud, a feature-length film about the infamous Fyre Festival disaster. Netflix also released a trailer for their documentary, Fyre: The Greatest Party That Never Happened, just last week pitting these two films head-to-head. Which is even more peculiar because apparently this documentary calls out the other one for being biased. 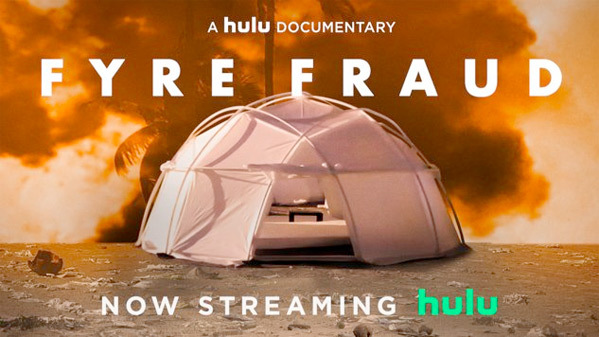 Hulu's Fyre Fraud is "a true-crime comedy exploring a failed music festival turned internet meme at the nexus of social media influence, late-stage capitalism, and morality in the post-truth era." Sounds like this is one damning doc. The directors add that, "Billy McFarland offers us a window into the mind of a con artist, the insidious charm of the fraudster and how they can capture our imaginations, our investment and our votes in the age of Trump." Take a look. Fyre Festival was the defining scam of the millennial generation, at the nexus of social media influence, late-stage capitalism, and morality in the post-truth era. Marketing for the 2017 music event went viral with the help of rapper Ja Rule, Instagram stars, and models galore, but turned epic fail after stranding thousands in the Bahamas. Featuring an exclusive interview with Billy McFarland, the convicted con-man behind the festival; Fyre Fraud is a true-crime comedy bolstered by a cast of whistleblowers, victims, and insiders going beyond the spectacle to uncover the power of FOMO and an ecosystem of enablers, driven by profit and a lack of accountability in the digital age. Fyre Fraud is co-directed by Emmy-nominated, Peabody Award-winning filmmakers Jenner Furst and Julia Willoughby Nason. Hulu has just released the documentary streaming exclusively - it's available to watch now. Who wants to watch both of the docs?